At noon the whole country became dark. This darkness continued for three hours. At about three o'clock Jesus cried with a loud voice, "Eli, Eli, lema sabachthani?" This means, "My God, my God, why have you left me alone?" Some of the people standing there heard this. The people said, "He is calling Elijah." Quickly one of the people ran and got a sponge. That person filled the sponge with vinegar and tied the sponge to a stick. Then he used the stick to give the sponge to Jesus to drink from it. But the other people said, "Don't bother him (Jesus). We want to see if Elijah will come to save him." Again Jesus cried with a loud voice. Then he died. Jesus cried out again in a loud voice and died. Sounds so routine. "Jesus executed at Golgotha!" "Convicted Blasphemer Crucified." "Jesus dies on a Cross." They don't even make good headlines. But underneath the headline is a powerful message: Jesus would rather die for us than live without us. This understanding is powerful when we realize he had the power to prevent it. It is convicting when we reawaken to the reality that it was our sin that made it necessary for him to die. Even more powerful, Jesus dies alone, with no one to save him from his pain or ridicule, no one to comfort or care for him, no one to offer verbal comfort and assurance. Jesus died knowing his best friends have betrayed him, denied him, and forsaken him. No wonder he cried out in a loud voice. 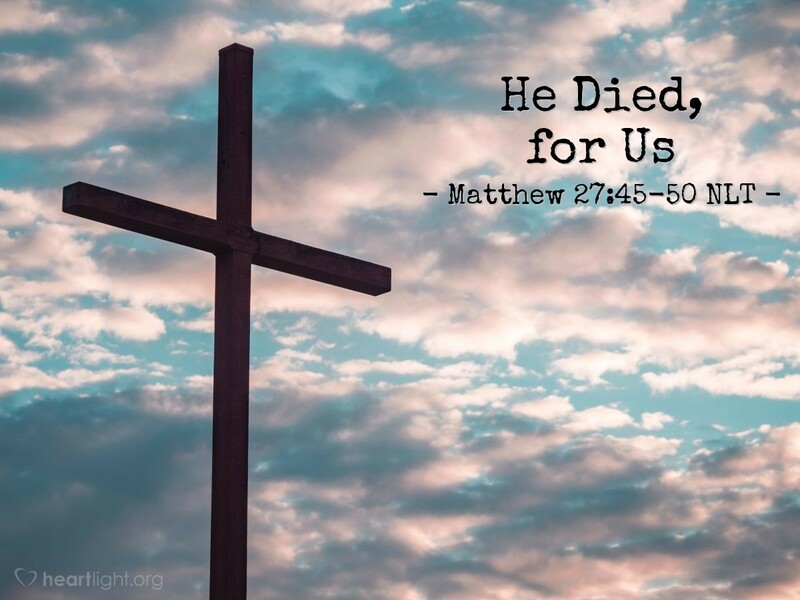 He died alone so we would never have to face humiliation, agony, abandonment, or betrayal alone. Almighty God and tender Father, despite my deepest reverential thanks, I can find no words that adequately communicate my heart-felt gratitude and appreciation for the debt that Jesus paid and the gift that you have given me through grace in him. Please empower me to live each day as a demonstration of my appreciation for your love. In the precious and mighty name of my Savior, Jesus Christ, I pray. Amen.